Dr. Chuck’s calligraphy sits over the desk in my new apartment, a verse from 2 Timothy. 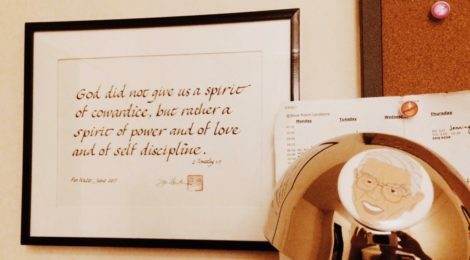 It says, “God did not give us a spirit of cowardice, but rather a spirit of power and of love and of self-discipline.” Dr. Chuck gave it to me when I saw him in his apartment about a month before he passed. He looked good that day, a little slow yeah, but pretty spry for an octogenarian, especially considering that most of us had been ready to see him go for a couple months already. This felt like a bonus visit. He kept introducing me to the other seniors. “This is Nate. He’s going to divinity school!” Most of them couldn’t hear him. Power, love, and self-discipline. On the list of character traits of which I am deficient, these would be close to the top of the list. Dr. Chuck and I didn’t talk about any of that though. He was just excited to hear about why I chose to go to divinity school. I imagine he already knew. Dr. Chuck went far away for seminary too after he graduated from Cal in the late 40s. But being Chinese American in the 40s wasn’t easy. A few months in another state made him homesick, and he finished his studies in the Bay Area. I don’t claim to understand what those months were like, but I can empathize with the viscerality of home and the displacement we experience as Chinese folk in a land that doesn’t understand or respect our bodies. Uncle Victor said that Dr. Chuck was painfully shy growing up and I know what he means. But so distant is this from the Dr. Chuck I know: proud, articulate, and thoughtful, with the long, wise bushy eyebrows that curve up at the ends. You don’t just get those eyebrows by being passive. You earn those eyebrows. But this place can steal the voice from out of your lungs if you’re not careful. Thankfully, that painfully shy boy became our pastor and served our church for forty years before “retiring” to teach in seminary for another twenty. Power, love, self-discipline. “I remember your sincere faith,” Paul writes to Timothy, “which first lived in your grandmother Lois and in your mother Eunice.” Lois and Eunice were Jewish women in a Greek world and Timothy was a bicultural young man being commissioned to serve among Jews. Paul invokes the names of these women as reminders to Timothy and to us that we are nothing without our ancestors, the strong women whose embodied prayers held us in a whirlwind world set on stealing our voices. It’s easy for me to look even now at the calligraphy above and to think only of Dr. Chuck but this is really about the Aunties and Grandmas who got us here. There were no magic tricks with them, just good, deep, rich, delicious love. This is about the power of Auntie Joy, who told me that one time, she left her clothes on the ground, blew a trumpet on the roof of her Christian boarding school, and pranked everyone into thinking it was the Rapture. This is about the love of Auntie Carol and Auntie Eva who, teaching us of the doctrine of adoption, made everyone into their sons and daughters. This is about Pastor Chris, my first pastor and our spiritual matriarch, the one who brought so many of us to Jesus. Just last week I visited a Southern Baptist church where they asked me if I “believe in woman pastors” (Do I believe in them? Like, do I believe that they exist? Are we talking about pastors or tooth fairies?) to which I responded, “I grew up with a woman as my pastor,” and deflected, tongue in cheek, “And I think I turned out ok!” What I should have said was, “I am who I am because women showed me what Jesus looked like.” Pastor Chris nurtured a whole generation of believers in our community, teaching us the Truth, playing basketball with our CCU team, and yelling at us for playing food games in the sanctuary. And then my own mother, even though the church failed her all those years ago, still gave me my daily bread and forgave me my trespasses, and there were many. I know Jesus because of my mother’s patience, love, and providence, her power, love, and self-discipline. Things are different than they used to be. Our parents and grandparents didn’t get to choose what their discipleship would look like or what issues they resonated with. They didn’t theologize about immigration or family, didn’t get to pick which neighborhood or job aligned most with their convictions, and didn’t pathologize about how this lack of choice affected them later in life. Theirs was an embodied faith, a faith that you could drink and smell and wrap your arms around, one predicated on an eschatological vision rooted in the hope of one to come, namely us, their children. Ours, however, is an intellectualized faith, one where we get to decide our issues and then share our endorsements for the world to see at very little cost to our bodies. We are pharisees praying on street corners. I asked Sarah if she thought our moms and grandmas paid too high a price for their love, if it came at the cost of themselves, their emotional health, and their voices. When I worked in Ping Yuen, Chinatown’s largest public housing stock, I saw too many elderly Chinese women depressed, paranoid, and alone, scarred by the trauma of immigration and the loneliness of displacement. Was it worth it? Those whose faith is embodied, whose faith is accompanied by calloused hands, whose faith looks like poetry etched on detention center walls, don’t ask questions like, “Was it worth it?” And it’s not even about toughness or denial or repression. It’s about how the choices Dr. Chuck had to make and the choices our Pau Paus and Gung Gungs had to make were worlds apart from the choices that I get to make now, choices about career and theology and home. For them, vocation was about life itself, not profession; compartmentalization wasn’t a luxury they had time for. And the miracle is, they did it. Last week Dr. Jennings said that it’s tenuous to say that God is always in control. A better word is that God is faithful. When I think of my grandparents, they might not have had a lot of control or choice, but they damn sure were faithful. This is a wisdom I have yet to tap into, and I’m not sure if I ever can, but I’ll be damned if I ignore it or write it off as some kind of simple minded survivalism. How will we welcome the wisdom of Lois and Eunice, of Dr. Chuck and Pastor Chris? Sarah’s response to me was simple: We need to suffer well. This is not to romanticize suffering or to gloss over the very real, traumatic experiences of our grandparents and the ways that that trauma often overflows into the cupped hands of the next generation. It’s not fair for us, however, to project our own definitions of health, resilience, and sanctity onto them. And yet, at the bottom, I think we all know that our own healing and liberation cannot be separated from those who came before us. To put it more directly: I love being Chinese. And I need the wisdom of my ancestors if I am going to be whole. My liberation is wrapped up in their liberation. And we cannot move towards healing if I do not at least try to dip my feet into the stories of their suffering and resilience, and on their terms. What I mean to say is that the Kingdom of God is for the foolish, the weak, and the poor. And I have spent my whole life trying to be the opposite of those things. Inasmuch as our ancestors came to America to escape suffering, it is actually the return to suffering on God’s terms that heals us, and yet it’s also what we are most afraid of. For this reason, the Gospel will always be foolishness to me because it challenges every fiber, every instinct in me that I have to preserve, protect, produce, and progress. I feel the resistance in my body with every step because I have built a life on the biggest magic trick there was, a dream fashioned by the belief that everything and everyone was meant to be subdued for my dominion. Repentance happens here every night under Dr. Chuck’s calligraphy, because I have to remind myself that I’m not here to become a better magician. So warped is my imagination by our pathetic definitions of success and the good life. How many names have been forgotten, Loises and Eunices who will never be memorialized? Theirs is the Kingdom of God. How frightening it is to step into professional ministry. I am becoming more and more aware of how dangerous this calling is as I am becoming more aware of how broken and sinful and twisted I truly am. And yet I am beckoned forward. And yet this God continues to lay out the ground before me. And so I walk. And complain. And stumble. And I keep looking back, wondering if it would actually be better to return to that burning town, but I haven’t turned to salt yet. But on my good days, and there are a few, I am reminded that God is a patient God, much slower than I to anger, and abounding in steadfast love that doesn’t fluctuate with my daily questions or moods. On my good days I think about Chinatown at closing time when all the tourists are gone and the sun is low enough to peak through the cracks of the buildings, I dream about liberation and healing for all of us, and I hope for the day when we won’t have to feel this aching restlessness anymore, this increasingly ubiquitous need to prove and protect ourselves. One day we will get there, but we have to do it together. We’ll know we’ve made it when our hands are calloused, our voices hoarse, our stomachs full, and when our eyebrows tell the stories of where we’ve been. Really enjoy your writing Nate, I relate to much of what you wrote – both about faith/suffering and being Chinese. Wishing you well as you start a new journey. Are you still in SF? Thank you brother. I’m doing the MDiv program at Yale now, so I’ll be on the east coast for the next few years! Kyle forwarded this to our family and I enjoyed reading it before I head out on my 100 mile bike ride. My journey today is nothing like the hardships my father endured as a young man but because he believed in the greatest power of all he knew that he would be safe wherever he went. You may not have the bushy eyebrows now (they take decades to earn) but I can assure you that you have the tools necessary to someday wear them proudly. Uncle Paul, hopefully one day I’ll have the eyebrows but also his gentle spirit. Hope you have a great bike trip! Nate, I opened up your blog through my email with just a glance at your name. The spirit of “cowardice….” caught my eye. I read on and remembered your voice from another blog post I read some time ago. I looked to the left and sure enough….NateJLee. Recently I took a job in ministry, and you are right the Truth is scary. I like the “mirror and shovel” comment. Amen. I cling to your words about your Mother, as I want to influence my children, as your Mother mentored you. Vocation – life itself. Amen. I want to welcome the wisdom of my mentors. I want to suffer well. It is sobering to step into ministry, and I will pray for you. Please pray for me. Keep writing and I’ll keep reading my dear brother in Christ. Thank you for your kind words and your prayers, Cindy. Sending you blessings as well as you continue on your journey! Nate, few people of “your” generation are able to so lovingly honor the “giant’s shoulders” that we stand upon. I’ve witnessed too many ministers, years after seminary, years ahead of you, who are oblivious to the invitation to honor. In fact, having been exposed to lots of church splits in Chinese churches through teh years, one of the underlying roots is that of dishonor. How many church splits are fueled by servants giving into dishonor in the name of “proving something right?” Very few are actually forging the way w honoring those who have come before us. That fact that you’ve been doing this wo the “seminary rite of passage” shuns those who have the degrees, yet still have not heeded to these invitations of honor. I’m encouraged. We don’t have to agree with everything in one’s theology to honor someone, to love someone. I’ve been tempted to dishonor someone many many times. Specifically, you know I don’t agree w everything in Dr. Chuck’s theology. Yet, especially with his passing, I’m spurred to honor him, and those I don’t agree with, but they’ve come before me. Dr. Chuck stood; I have witnessed his legacy. He surely earned his eyebrows, and i honor him. You and I will never know that context he grew up in and received his training in. You Nate have a distinctive posture of honor. It’s coming out of your pours. Not saying that a little homesickness is not contributing to it. Nevertheless, it is good. May God honor you for that. Thank you Steve for this and for being the one to teach me so much about honor! I still have a lot to learn but I’m finding that the language and the work of honoring folks to undo our shame can be really really powerful and healing. We’ll talk more!